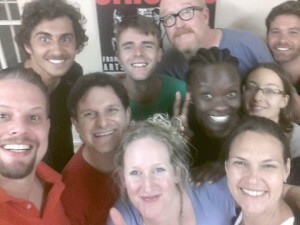 We had a great drop-in class tonight with Joe Bill, teacher of scenic and comedic improvisation all the way from Chicago. Each player chooses a letter, A, B, or C.
Each player chooses an emotion. Player A reaches out, discovers an object, and interacts with it in terms of their emotion. Players B and C react to A discovering the object in terms of their own emotions. Player A gives the object to whichever other player seems most reluctant. The most reluctant player accepts the object and interacts with it in terms of their own emotion. The most reluctant player gives the object to the remaining player. They in turn also accept it and interact with it in terms of their own emotion. The players then play out a scene where they have a conversation about anything other than the object. The players then try and use the object as a metaphor for whatever conflict has emerged. Organically, two of the players will generally gang up against the third. The last step is for one of the players to switch sides and join the third player.